Sandy and I first came to Bathurst in 1990 after buying an old terrace house to renovate on Keppel Street. We thought it was a quiet country town with beautiful old buildings and landscapes, with all the necessities to live comfortably. When I moved to Australia, Sandy was working in Lithgow and I lived in Mount Victoria. We decided we wanted to live and work somewhere rural rather than towards the city and Bathurst fit the bill. It is big enough to have all the services and shops we need but still has that country town feel. Bathurst has a warmth and comfort that comes with being a rural town. You know many of the people but, at the same time, have all the comforts you need to get by. There’s a nice vibe on the streets that is friendly, and there are great food and coffee venues. The beautiful old buildings and landscapes - Crago and Tremain’s Mill, Ribbon Gang Lane where you can find the best pizzas in town at Church Bar, the old Webb & Co. building, and the famous Bathurst Court House. Our favourite restaurants are Dogwood BX or Vine & Tap. Both are great examples of quirky venues with their own unique country charm. Definitely a glass of Renzaglia Nuovo Red with Vine & Tap’s delicious salumi board while sitting outside in their piazza on a fine autumn day. It can’t be beaten. 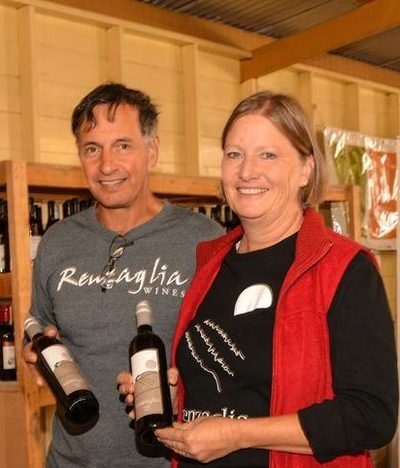 You can visit Mark and Sandy at Renzaglia Wines, their family owned winery on the outskirts of Bathurst.